On the basis of the general framework of United Nations’ "indirect/satellite" accounting system O Ointegrated system of environment & economy accounting SEEA (1992) and 93’ SNA, the specific objectives of this paper is try to construct one simple, effective and practical of China (CSEEA), and thereby trial estimate the 1992 Chinese environmental adjusted GDP (Green GDP), under Chinese National Accounting System’s reform practice. The discussion of integrated accounting for environment and economy under the framework of sustainable development has received increased attention by the international society, since the report of the World Commission on Environmental and Development was published in 1987. This heightening interest led to the proposal contained in Agenda 21 of the United Nations Conference on Environmental and Development (Rio de Janiero Earth Summit 1992) to encourage the development of integrated system environmental and economy accounting. In China, such proposal was also contained in the following Chinese Agenda 21 which was put forward in 1993. As well-known, since the 80’s, China began to try to transfer her national accounting system form MPS to SNA in order to be suitable to her market-oriented economy reform process began from 1978. Till 1992, one new national accounting system was put forward and was to be spread in all over the country. However, this new national accounting system is still belong to the traditional SNA (1968) pattern, the natural resources and environmental factor was not considered specially in it. Meanwhile, works on the study on Chinese integrated system of environmental and economy accounting were just started. By now, various methods about how to realize the integrated accounting between environment and economy have been proposed, two of which methods are noticeable: one is so called "direct "method modifying the core system of the SNA itself with natural resource factors, and the other is so called "indirect (satellite)" method developing an SNA satellite system for integrated accounting. The former is abandoned gradually today for it’s complexity and huge works and non-sustainable for the National Accounting System. On the other hand, the later, however, is accepted widely all over the world, especially, after the United Nation revised its traditional 68’SNA and developed one general framework of integrated system environmental and economy accounting (SEEA) as a part of this revision in 1993. Till now, various components of the SEEA have been tested in case studies in Mexico, Papua New Guinea, Thailand etc.. Specially, one concrete and complete national SEEATiJapanese SEEA was developed as a satellite account interconnected with the central framework of Japanese SNA in Japan in 1995. The work in Japan not only accumulated many good experience of construction of the concrete national SEEA but also demonstrate further that SEEA is an efficient system which can provide a valuable information base for integrated development and planning policy. Under this situation, it’s doubtless an urgent and important task to develop a simple, effective and practical integrated system of environment & economy accounting of China (CSEEA), which is consistent with the Chinese new SNA framework and capable of assessing the burden of economic activities on the natural resources and environment in China today. And using the other country’s experience, especially Japan’s, for reference is obviously an effective way. On the basis of the United Nation’s 93’SNA and General Framework of Integrated System Environmental and Economy Accounting and Chinese National Accounting System’s reform practice, the specific objectives of this study is try to construct one simple, effective and practical integrated system of environment & economy accounting of China (CSEEA), and thereby estimate the 1992 Chinese environmental adjusted GDP (Green GDP) and assess of two major aspects of economic policy, (a) the sustainability of economy growth, (b) the structure distortion of the economy by environmentally unsound production and consumption pattern. This study is further research on the basis of our one former works on input-output accounting for natural resources-economy-environment. The following table is the basic structure of United Nations’ Integrated System of Environment-Economy Accounting (SEEA), in which the shaded area represents the SNA’s part, supplies and use accounts, and non-financial/assets accounts. The non-shaded area represents environmental and natural resources elements related with its economy uses. In our CSEEA matrix, there are 27 rows which be divided into 7 parts (Opening Stocks (1 row), Use of Economy Natural Assets (8 rows), Supplies & Value Add (8 rows), Use of Non-Economy Natural Assets (5 rows), Green Value Add (1 row), Other Adjustments (3 rows) and Closing Stocks (1 row)) and 28 columns which be divided into 6 parts (Domestic Production (3 columns), Final Consumption (3 columns), Foreign Trade (3 columns), Economy Assets (14 columns), Non-Economy Assets (4 columns) and Total (1 column)). (3) Degradation of natural assets caused by residuals: qualitative deterioration of natural assets, such as environmental pollution caused by economic activities will be evaluated in monetary terms. The imputed environmental costs for the following items be considered by source and type of natural assets: Air pollution (SO2, Dusty) and Water Pollution: Sewage (BOD, COD). (4) Destruction of ecosystem: ecosystem function lose of several kinds of resources will be considered by type of natural resource (i.e. forest, grass, cultivated land). All study is based on the marginal opportunity cost theory for natural resources pricing and Chinese National Accounting System’s reform. The date used in this study come from Chinese Statistics Year-Book, Chinese Input-output Table, Chinese Environmental Statistics Year-Book, the relevant materials (papers, reports and government documents etc.) on Chinese natural resources and environmental and the relevant research reports on natural resources pricing and accounting etc. -stock of tangible assets at the beginning/end of period that consist of man-made assets i.e. inventory stock, fixed assets, and natural assets i.e. cultivated assets, and non-produced tangible assets such as land, timber tracts, etc..
-costs for cultivation/exploitation of recovering these natural assets. (20), depletion of these natural assets, and (21), degradation of these natural assets caused by residuals. -monetary valuation of environmental pollution, such as air and water pollution caused by residuals from economic activities. -net value added after subtracting the imputed environmental coasts, which are not evaluated in the market, from net domestic product (NDP). NDP is the value added after subtracting the consumption of fixed assets, i.e., the depreciation of accumulated assets, from gross domestic product (GDP). The imputed environmental costs are monetary evaluation of depletion and degradation of all natural assets (both economy natural assets and non-economy natural assets), hence are to be subtracted from NDP in order to reach net welfare which takes into account the burden on the environment of economic activities. -changes in amount due to such factors as war, natural disaster, new discovery, i.e. discovery of natural assets, changes in land use, natural growth of cultivated assets and so on. -costs of production activities that consist of intermediate inputs, consumption of fixed capital, indirect taxes and subsidies, compensation of employees and operating surplus. -this consists of land use, /cultivated land , subsoil resources  which is divided into coal , oil , natural gas . -this only consists of non-produced natural assets  which is further divided into air , water . Two types of adjustments are calculated with respect to the accumulation of all natural economy assets. The adjustments made are of the type of adjustments relating to the accumulation of natural assets, and other adjustments. Adjustments relating to accumulation of natural assets comprise of adjustment imputed environmental costs and volume changes due to economic causes. Other adjustments capture volume changes due to non-economic causes and revaluation due to market price changes. Meanwhile, the adjustments of man-made economy assets, fixed assets, only capture volume changes due to non-economic causes and revaluation due to market price changes. The external cost (exhaustion/damages) brought by economy activities are composed of two main parts. One is depletion of resources caused by the over-exploitation of nature resources, which mainly refers to the temporary or eternal exhaustion of physical resource in amount, or in the other words, is a disappearance of some kinds of physical resources temporarily or eternally. The other is degradation of natural assets caused by residuals and destruction of ecosystems caused by the pollutant emission produced in the process of economy activities, which mainly refers to the quality decreasing of environmental resources (worsened in quality), means the service-quality of environmental falls down. Environmental deterioration associated with economic activities were evaluated in monetary terms and regarded as the cost of economic activities. Environment-related external diseconomies were measured in monetary terms. The methodologies to arrive at imputed environmental costs are based on the theory of marginal opportunity cost and the method of maintain cost. According to marginal opportunity cost (MOC) theory, marginal opportunity cost refers to the costs not only the production cost but full costs formed in the process of human activities, it’s an useful tool to measure of the results of resource exhaustion and pollution emission from the perspective of economics, or, in the other words, it’s an efficiency evaluation method to evaluate human economy activities in the point of society view. MOC is equal to the total traditional production costs in the process of a certain human economy activities plus the social costs originating from its side effects. It is the most convenient and common concept in the management of rare natural sources and environmental protection. This cost is composed of three components. The first is marginal production cost (MPC), which refers to labor, capital and the others traditional production material input. The second is marginal environmental or external cost (MEC), which refers to the loss in environmental ecology (degradation of natural assets caused by residuals and destruction of ecosystems) caused by economy activities. For instance, forest degeneration, results from wood over-cut, can lead to soil erosion and deposition of rivers and reservoirs, which will further have adverse effects on agricultural output, power generation and water quality. The third is marginal user cost (MUC), which has something to do with our consideration for the future. The exploitation of non-renewable resources with limited reserves means their exhaustion in the future--depletion of resources. In other words, the utilization of per unit of resource at present implies the decrease of one unit of resource in the future. Therefore, a cost for scarcity should be complemented in MOC. The scarcity cost depends on the scale of exploitation, on the proportion of demand for resource in the future to current demand, on the possible substitutions in the future, its cost, and discount rate. Regarding renewable resources, it is not necessary to add scarcity cost to MOC, apart from MPC and MEC, for the consumption of renewable resources can be made up by natural and artificial regeneration. However, in many countries, many resources were utilized in a way of non-sustainability, some even might cause the depletion of resources. In this case, the renewable resources should be treated as nonrenewable resources while measuring their value. The method of maintenance cost in principle will compute the imputed environmental costs, which enables the measurement of qualitative and quantitative changes in the environment by estimating the required cost of maintaining the quality and quantity of the environment at a certain level. It will be necessary to assume a specific activity to keep the quality and quantity of the environment at a certain level for each of the natural assets considered. Estimated as cost of reducing one unit of discharge of each substance (air pollution, and water pollution) at the source and then multiply this by the volume of this discharge to get at the estimated value of the degradation of natural assets caused by residuals. This method is used in estimation of use of non-produced natural assets of non-economy natural assets. The costs of the destruction of ecosystem due to land development will be set equal to the value added that will be lost if the development is terminated. The costs of the destruction of ecosystem in cultivated forests are estimated by the MEC of live wood. It’s same to the destruction of ecosystem in grass. The costs to cultivated forest and grass destruction due to man and nature caused (forest fires and logging damages) will be set to the value of production lost corresponding to the damaged cultivated forests. This method is used in estimation of use of produced natural assets of economy natural assets. Consumption of non-renewable resources may eventually require a substitute to be found for them at some future date. For example, consuming a ton of coal now means that there will be one ton less available at some future date. The lost benefits due to future use forgone are known as the user cost , or depletion premium. Optimal exploitation of appreciation in the value of the asset is less than the rate of interest. For extraction of sub-soil resources, the cost is the difference between the actual revenue from exploitation and the constant eternal revenue. Environmentally adjusted net domestic product (EDP) is the value added obtained by subtracting the imputed environmental costs (use of economy assets and use of non-economy assets) from Net Domestic Products (NDP). NDP is the value added obtained by subtracting consumption of fixed capital from gross domestic product (GDP). Consumption of fixed capital is the required cost of restoring the stock of fixed capital used in production activities to its opening level and therefore it is excluded in obtaining the net value added generated by economic activities. The imputed environmental costs are the costs of depletion, degradation and destruction of the natural assets due to economic activities and should be excluded in computing the environmentally adjusted net domestic product. 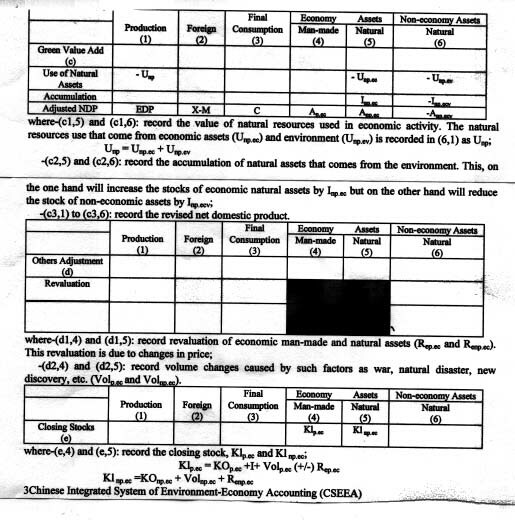 Total imputed environmental costs (including the deplete of natural resources, the destruction of ecosystem and the degradation of natural assets) were about RMB___________ billion, or billioof GDP(or f GDP(of NDP) in 1992 (see table 5-1). RMBfrfrom use of billion (’mP|TD) from use of non-economy natural assets, in which from from air pollution and 64.84% from water pollution (see table 5-2). and 99billion (0.18%) from use of natural gas (see table 5-3). Degradation of natural assets was RMBegegradationbillion, in which degradation of natural assets caused by destruction of ecosystem was RMBofof natural billion (billio) (only forests, grass and cultivated land be considered here), degradation of natural assets caused by residuals was RMB ( (only foresbillion (illion) (only air pollution (SO2, dusty) and water pollution: sewage (BOD, COD) (see table 5-3). RMBgr0.._ass anbillion (99.52%) from use of cultivated land. In degradation of natural assets caused by residuals, there are RMBilillion (billion (illio) come from degradation of air quality caused by SO2, dusty emission, RMB d dusty emibillion (ilill) comes from degradation of water quality caused by sewage (BOD,COD) emission (also see table 5-4). Defensive expenditures on the maintain of natural assets ware RMBef12.2226998 billion, in which 43.06% iRMBMB5.262673 billionbiwere used on the maintain of economy natural assets, 56.94%6.RMBMB6.9600268 billionbi were used on the maintain of non-economy natural assets. dusty anRMBMB3.952119256 billionbibisee table 5-5-5. RMB.1553274.1352 Billion (98.85% of total tangible assets). respectively compared with the beginning of 1992'svesee table 5-7-7. There are three factors which results in natural assets increased at the end of 1992. First one is the high re-evaluation of natural assets which caused by the price (increasing) change of some relative products, e.g. high re-evaluation of forest assets which caused by increase of log price (product of forest resources), sub-soil resources (coal, oil and natural gas) price etc.. Second is the transfer from non-economy natural assets to economy natural assets, e.g. sub-soil resources coal, oil and natural gas as we mentioned above. The third one is the increase of cultivated natural assets (mainly refers to produced natural assets), e.g. forest asset come from tree planting. There are two factors which results in natural assets decreased at the end of 1992. First one is the depletion/degradation of natural assets caused by economy activities. Second is natural assets destroyed by non-economy factors (earthquake, fire, flood, war etc.). (99 Billion (97.79%)are come from economy activities respectively. 1. Ademan, M. A., Harindar De Silva, and Michael F. Koeln.1988. "User Cost in Oil Production". Resources and Energy. 13 : 217-240. 2. Ahmad, Y. J., S. El Serafy and E. Lutz (eds) 1989. Environmental Accounting for Sustainable Development. The World Bank: Washington, D. C.
3. Bartelmus, P. 1992. "Accounting for Sustainable Growth and Development". Structural Change and Economic Dynamics. 3(2),242-260. 4. Ming LEI. 1997. "Study on Integrated Accounting for Natural Resources and Economy". Journal of Systems Science & Systems Engineering. Vol.6, No.3. pp.257-262. 5. Ming LEI. 1998. "Linkage Analysis of Energy-Natural Resources-Economy-Environmental". Journal of Systems Science & Systems Engineering. Vol.7, No.3. pp.368-378. 6. Ming LEI. 1999. "Input-output Accounting for Natural Resources-Economy-Environment". Proceedings of the 14th World Congress of International Federation of Automatic Control (IFAC). Vol. L, pp.115-120. Elsevier Science Ltd., Oxford, UK. 8. Lutz, E(ed.) 1993. Toward Improved Accounting for the Environment. The World Bank: Washington, D. C.
9. Stahmer. C. and Van Tongeren, J. 1991. "Integrated Environmental and Economic Accounting: Framework for a SNA Satellite System". The Review of Income and Wealth. 37:111-47. 10. United Nations, 1993. System of National Accounts 1993, United Nations, New York. 11. United Nations. 1993. "Integrated Environmental and Economic Accounting (interim-version),Studies in Methods: Handbook of National Accounting". Series F, No. 61, New York. 12. Pearce, D.W. and A. Markandya, 1989. Marginal Opportunity Cost as a Planning Concept in Natural Resource Management. In: Environmental Management and Economic Development (Schramm, G, and Warford, J.J., (Ed. )),Johns Hopkins University Press, Maryland.